Ride onSwiss Military Pinzgaur, a true ATV ! Hold onto your seats and get ready to hoot and holler - youʻre about to take on the Puaʻa Māiki! Board the renowned Swiss Military Pinzgauer all-terrain vehicle and ready yourself for a cultural adventure! This off-road expedition treks through one of Hawaiʻiʻs most sacred and fabled places, Waimea Valley, to uncover an exhilarating past of ancient Hawaiian history. 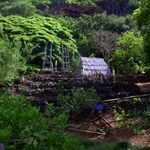 Travel back in time as we visit one of Oʻahuʻs last heiau (Hawaiian temple) while your expert Hawaiian guide relates a spellbinding oral tradition of folklore and mythology. Guests will venture deep into the back valleys of Oʻahuʻs North Shore while enjoying an array of rugged terrain and wild natural landscapes. Tackle lush jungle trails and climb open windswept ridgelines all from the comfort of your high-stanced, open-aired Pinzgauer. Revel in ʻāina (nature) as you witness rare native plants and experience Hawaiʻiʻs unique natural environment. 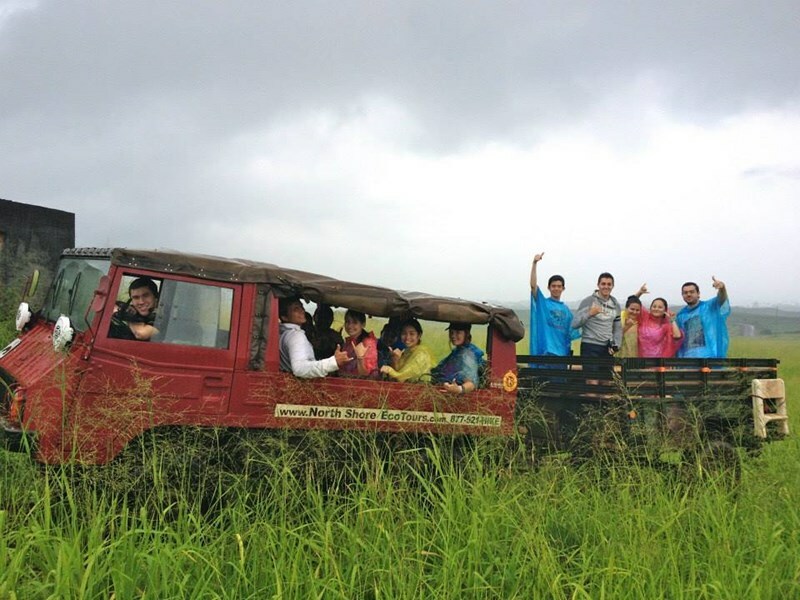 And if that’s not enough, your off-road adventure will end at a private mountain overlook with stunning views of the Waiʻanae Mountains and the North Shore coastline! Only 8 seats available – Reserve yours today! 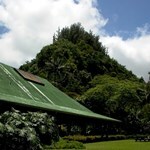 Pick-up site: Waimea Valley visitor’s center (at the end of Waimea Valley Road). There is ample parking and public restrooms in the visitor’s center. Please report to the pick-up site no later than 1:50pm (10 minutes before the start of the tour). Look for our off-road vehicle near the visitor center entrance. 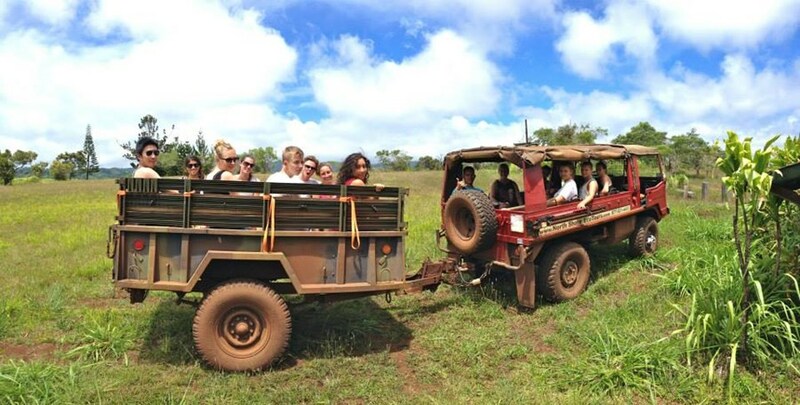 Tour includes: Pinzgauer all-terrain vehicle, a knowledgeable guide, mosquito repellent, rain poncho, protective eyewear, water, snacks, and Waimea Valley park admission. Required items to bring: covered shoes and a smile. Optional worth bringing: camera, light jacket, sunglasses, sun block, and hat. Waimea Valley admission: For admission prior to the start of your tour: print out and present your tour voucher at the Waimea Valley admissions booth. For admission after your tour: you will receive a voucher ticket from your guide valid for up to one week after the date of your tour; present your voucher at the Waimea Valley admissions booth. Caution: Dress accordingly; conditions can include rain or sunshine, cool mountain breezes or high humidity. Be advised that this is a rough ride; please take the proper precautions if you are susceptible to carsickness. Due to the vehicle’s sudden jerky movements caused by rough roads, we do not recommend this tour for people with back or neck problems and/or women who are pregnant. Inquire first before booking if you or anyone in your party has any medical conditions that may affect his/her ability to sit on a bumpy off-road ride for 2 hrs. For safety purposes, children under 6yrs are not allowed on this tour.' All guests are required to sign a waiver & release form prior to the start of their tour. During rain and/or muddy conditions riders can get dirty - please DON'T wear your favorite aloha shirt! Pua’a Maiki ~ The “Piglet” Tu, F 1:45 PM 2 hours 30 minutes Waikiki & Koolina Area Hotels. Click the red "book it" button for exact pickup times & locations. Click the red "book it" button to see live availability calendar & check in directions. See map below for approximate location. Yes, this tour requires advanced reservations. What makes North Shore EcoTours differ from the rest? 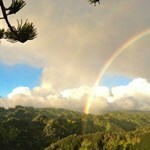 Since we operate on private property no other company can show you O’ahu (Oahu) nature like us. We guarantee all guests a secluded and truly unique experience. Private property also means controlled access which results in minimal environmental impact and therefore pristine natural landscapes. 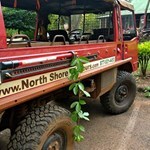 The bottom line is that no other company can provide what North Shore EcoTours can. Most companies visit places and trails that are already accessible to the public, such as Diamond Head or Manoa Falls, resulting in an experience that is available to everyone. It also means greater foot traffic, which translates to noise pollution and lots of trash. With North Shore EcoTours, you are guaranteed an experience that no one else can offer and a promise that your special tour belongs to you and only you. 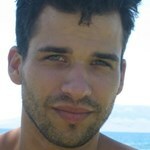 Our “guides” are not the typical tour guides found within the tourism industry. North Shore EcoTours features cultural practitioners, Native Hawaiians, and Hawaiian educators that present Hawaiian history and environment from a “Native perspective.” Our alakaʻi (guides) posses a wide range of talent, skill, and cultural understanding. Many hold advanced degrees in either Hawaiian studies or related disciplines. Others are cultural practitioners with expertise ranging from hula (dance) to lomilomi (massage) to lā’au lapa’au (medicinal herbs), and more. All guides are 100% local and collectively provide the highest quality and most authentic cultural information in the industry. This is as real as it gets! Many tour companies have guides that are well trained in history and “tourism facts.” Although highly knowledgeable, many are not Native Hawaiian or have no roots to O’ahu (Oahu) or any island. As a result, other companies cannot guarantee authentic cultural experiences. 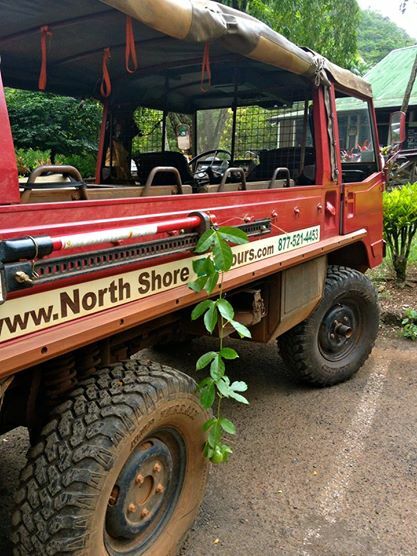 North Shore EcoTours proudly features Hawaiian guides for “Hawaiian tours.” Say Aloha to a beast of an off-road vehicle that makes other 4x4s look like child’s play – the world renown Pinzgauer ATV is arguably the best off-road vehicle ever produced. Ours come directly out of the Swiss Military arsenal so you know they are rugged and have proven themselves in some of the most treacherous mountain terrain around. These open aired “Hawaiian safari mobiles” will turn your North Shore visit into an exciting outdoor expedition! 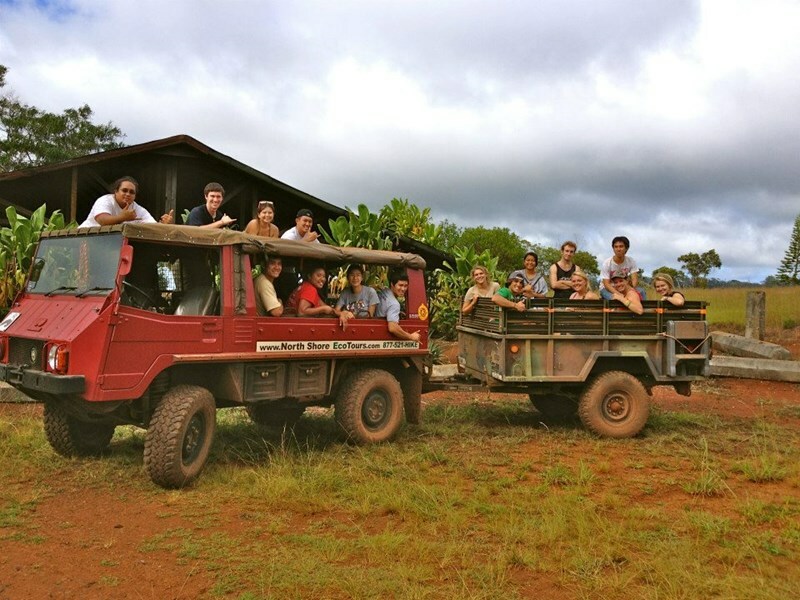 The Pinzgauer is in a class by itself and will guarantee all guests ultimate views and ultimate fun! Most companies utilize vans or mini busses that provide an enclosed air conditioned ride. That’s nice and all, but they can’t go where the Pinzgauer can. Furthermore, when traversing nature and the great outdoors, an open air all-terrain safari vehicle is really the only way to go! Intimate groups promote safety and learning, which means an overall richer experience for everyone. They help foster a wonderful learning environment where guests can hear the information and participate in discussions. Smaller groups are also more effectively managed and thus ensure a safer hiking experience. And let’s not forget that less feet means less environmental impact, ensuring pristine conditions for nature seekers today and generations to come. In this case, “less is definitely more.” Due to the size of many tour operations, other companies are unable to offer the same level of service, safety, quality of information, and environmental care. We do not claim to “know it all” we specialize in one geographic location and only one, Waiʻalua (North Shore), Oʻahu (Oahu). We therefore offer the most in-depth and highest quality information on the cultural traditions, history, and natural environment of the North Shore area. 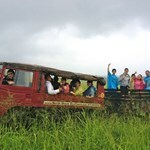 Many companies expand their tour operations to encompass the entire island. Visitors therefore receive a “LITTLE of everything” and most times never get a true sense of the places they visit. 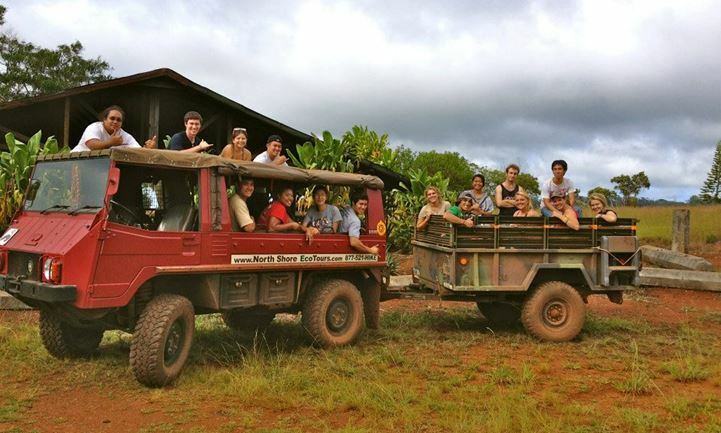 Since Oahu’s North Shore community, culture, history, and environment is our main focus, with North Shore EcoTours, you get insight into a special place that canʻt be found anywhere else. How many guests can each tour accommodate? Small groups ensure safer hiking experiences. Each guide is CPR and first aid certified. They are also equipped with a first aid kit and both a cell phone and handheld CB for communication purposes. Rain ensures that plants live, streams flow, and off-road mud bogging can occur. :) Our tours go out rain or shine; rain ponchos are provided. * North Shore EcoTours reserves the right to cancel tours in the rare event of adverse weather resulting in unsafe hiking conditions. We assess weather daily and will only make these types of decisions on a day to day basis. What should we bring on the tours? Covered shoes are a must on all hikes and are highly recommended on off-road tours as well. 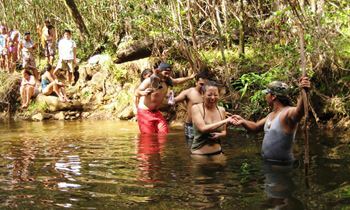 Guests that participate on either the Huakaʻi Iki and Huakaʻi Nui hikes will get wet and should bring water shoes or rubber sandals (for stream crossings), a towel, and extra clothes. Snacks for the kids are good. Personal medication if any, is a must. A camera…charged and ready to go. Is there a safe place to park our vehicle while on tour? The parking location is in the North Shore Marketplace parking lot. It is Hale’iwa’s largest mall and is located on the main road with high visibility and a roving security guard. * North Shore EcoTours and North Shore Marketplace are not responsible for any stolen items or damaged vehicles due to break-ins. Please do not leave any valuables in your car and keep bags and other items out of sight. What kind of “gourmet lunches” are provided? 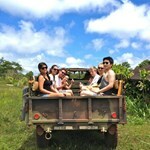 North Shore EcoTours offers lite, healthy, Asian summer rolls on all of our hiking adventures. These refreshing lunches feature locally grown produce and are a perfect accompaniment to any physical outdoor activity. We do offer the same type of Asian summer rolls, as mentioned above, that are vegetarian with tofu. There are lots of trees. :) In other words, do your business at the North Shore Marketplace pick-up site prior to tour departure. Why do you require guest signed liability waivers for all tours? Safety is our main concern. Despite taking every precaution to provide a safe hiking environment, we require signed waivers for a couple of reasons. First, so the guest is aware of the inherent risk involved in typical outdoor activities. Second, to serve as a precaution to protect ourselves. 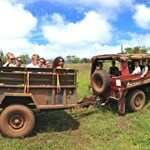 These waivers are similar to ones required from every eco-tour operation on O’ahu (Oahu). 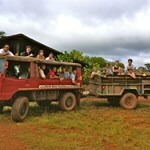 Everything worked perfectly for this tour - there were only two of us on the Piglet with guide Kaola, weather was beautiful! Because Kaola is a full-time instructor of Hawaiian studies at the University of Hawaii, he knew so much and could answer all our questions! This tour is an out-of-the-way and off-the-beaten-path kind of tour - up into the jungle and agriculture orchards (a banana orchard!) 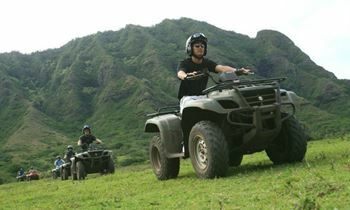 ... moreon an open-air 4 wheel drive ATV. We couldn't have been more pleased with our choice. 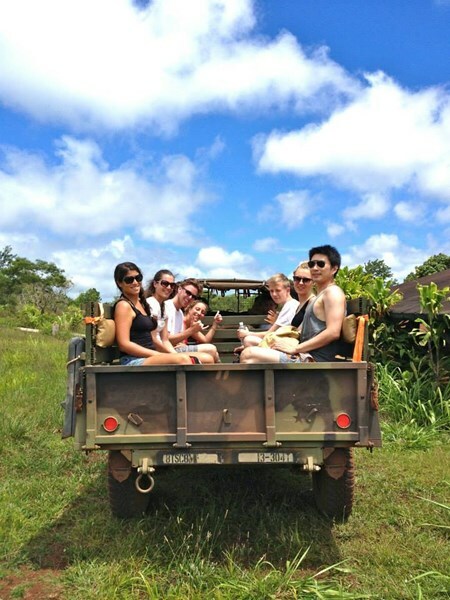 We took several tours while we were on Oahu, and this one is the one we'll remember most fondly.